If spring and summer are the things that make your heart sing, experience them with our outdoor recreation opportunities! Slip down a slide at a playground, scale a climbing wall at Lincoln Marsh, meet native wildlife at Cosley Zoo, bike, walk, or run through our 54 parks, swim at both of our aquatic facilities, play mini golf, go skateboarding, and more. Play safely! We offer several park trails suitable for walking, running, and biking to suit your speed. *Trail runs adjacent to the Illinois Prairie Path. **Plans to create trail linking to the Illinois Prairie Path. We maintain and operate two pools for fun in the sun all season long. Between them, Rice Pool & Water Park (1777 S. Blanchard St.) and Northside Family Aquatic Center (1509 N. West St.) offer 1M and 3M diving boards, water and drop slides, volleyball and sand play areas, sun hills, 25M lap lanes, zero-depth pools, children’s spray area (including waterfall, baby pool, geysers, and morning glories), snack stands, lounge chairs, and more. You can book your birthday party at Rice Pool & Water Park! Click here to learn more. Swim lessons are available for children 3 and up. See more here. The Wheaton Park District Barracudas Swim Team calls Rice Pool & Water Park home. Made up of boys and girls ages 6 to 18 who swim in their own age groups, the team competes in the West Suburban Swim Conference. Find out more here. We maintain 23 playgrounds across Wheaton for free community use, including Northside Park, Seven Gables Park, Kelly Park, Toohey Park, Triangle Park, Atten Park, W.W. Stevens Park, Hillside Tot Lot, Hoffman Park, and more. You’ll find slides, monkey bars, climbable boulders, bridges, nets, and other activities around the district. Several parks are available to rent for birthday parties, reunions, retirement parties, company outings, and other social functions. For the full list of parks and addresses, click here. Arrowhead Golf Club’s 27-hole championship course is open for the season! Chip past our white tour sand bunkers, practice your swing on our lighted driving range, take lessons from our PGA Golf Professionals, and receive custom equipment fitting at Pelican Golf. Once your round’s done, visit Arrowhead Restaurant & Bar for the best meal you’ve ever had on a golf course, and book an event in one of the three-story clubhouse’s elegant spaces. To learn more and book tee times, visit arrowheadgolfclub.org. Arrowhead Golf Club is located at 26W151 Butterfield Rd. Cosley Zoo is an Association of Zoos & Aquariums-accredited facility beloved by generations for its commitment to the highest standards of animal care, conservation, and education. But the zoo wouldn’t be the fantastic place it is without its 200-plus animals representing more than 60 native Illinois species, from ducks, fox, coyote, and hedgehogs to horses, donkeys, llamas, and bobcats. Cosley Zoo has extended hours (9A-5P) April through October. Learn more at cosleyzoo.org. Cosley Zoo is located at 1356 N. Gary Ave.
Thousands of people visit Lincoln Marsh Natural Area each year to hike, picnic, and enjoy the outdoors. Nature enthusiasts find great bird-watching opportunities. Lincoln Marsh is an ideal place to jog or bike because its trails connect with the Illinois Prairie Path. The marsh’s 151 acres include wetland, woodland, and prairie ecosystems. Each spring, district staff members conduct controlled burns across much of its acreage to release nutrients into the soil from the husks of the grasses and other plants that died over the winter. Lincoln Marsh offers programming opportunities to more than 13,000 participants per year. We provide Nature and Adventure programs to schools, groups, scouts, individuals, and families. Our Challenge Course includes team-building, high ropes, a climbing tower, and more. To learn more, visit lincolnmarsh.org. Between the Illinois Prairie Path through downtown Wheaton and Courthouse Square lies Clocktower Mini Golf & Skate Park. Here, you can putt through 18 holes, ride the rails at a 12,000-square-foot skate park, enjoy concessions, and hold birthday parties and group outings. Hours vary by season for mini golf and skateboarding; click here for applicable hours. Washrooms are located inside the concession stand in the center of Clocktower. They’re man’s best friend, they’re part of the family, and they need exercise too! Dogs are welcome in our parks, but certain limitations do apply. Dogs must be on a leash (no longer than six feet) while in the park. Dogs are not allowed to run loose in the parks. Any animal found running loose may be apprehended and taken to an animal shelter or public pound at the owner’s expense. Dogs are not permitted in picnic areas, athletic fields, or playgrounds. Cruel treatment and/or neglect of any animal are not allowed. “Predator” animals are not allowed on district property or natural areas unless they are confined within a closed vehicle. Dog owners must clean up and properly dispose of dog waste. Dogs are not allowed at Cosley Zoo. These items are included in the Wheaton Park District Ordinance Regulating Conduct in Public Parks, R-90-8, 1990 and are also covered in the Wheaton Municipal Code, 1998, Chapter 14 – Animals. Please keep your dog under control at all times, and do not let him or her disturb other visitors or wildlife. Remember to provide your dog with plenty of fresh water. Please be aware of the signs posted in our parks regarding dog policies. Put your feet together and play pétanque at Northside Park or Memorial Park! Pétanque is the second most popular participation sport in Europe after soccer. The word means ‘feet together’ in French, and games consist of two teams of one, two, or three players trying to throw their boules (balls) closest to the cochonnet, or target ball. The first team draws a circle from which each player must stand and play, throws the cochonnet in any direction between 20 and 33 feet away, and tosses their boules as close to it as possible. The second team knocks away the first team’s boules, tries to get theirs closer than the first team, or both until the teams are out of boules. At the end of the round, the team with the boule closest to the cochonnet gets a point for every boule closer than the other team’s boules, and the first team to 13 points wins. See further instructions on Petanque How to Play (PDF). The pétanque courts at Northside Park and Memorial Park don’t require reservations. Just bring your boules and play. Do you already love pétanque and want to meet more teammates? Join DuPage Pétanque, a chapter of Chicago Pétanque Club! They meet three times a week: Tuesdays and Thursdays at Memorial Park at 9A and Sundays at Northside Park at 12P. With more than 800 acres of open space and 54 parks to choose from, it’s easy to find a perfect place to picnic. Spread out a blanket on the grass at Kelly Park, Rathje Park, or Northside Park, or spend your lunch break on a bench instead of in an office chair. Bring your racquets (and a friend or two) to one of our tennis courts and practice your forehand, backhand, serves, and lobs! Tennis courts are located at Northside Park, Central Park, Hurley Gardens, Atten Park, and more. For the full list of parks and addresses, click here. 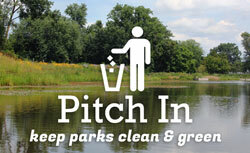 Help keep our parks clean and safe for other visitors, pets and wildlife! Be sure to clean up all fishing line and hooks. Find out about weather delays or facility closings before leaving home or while on the go! Visit the Status Updates page for details.